Royal Caribbean Cruises has launched a $5 million partnership with the World Wildlife Fund to cement the cruise line’s commitment to ocean conservation. The five-year deal was announced today in the remote village of Donsol, in the Philippines, where WWF supports the local tourist industry’s major attraction – swimming with whale sharks, the largest fish in the world. Royal Caribbean chose the venue partly in tribute to their 11,000 Filipino crew, who form the biggest single national group among their worldwide employees. RCL and the WWF hoped to give an international group of journalists the chance to swim with the whale sharks, which are longer than a London bus. Inauspiciously, on an untypically cool and cloudy day, the giant creatures were reluctant to co-operate. The partnership’s first visible effect begins tomorrow when passengers on all Royal Caribbean, Celebrity, and Azamara Club Cruises’ ships will find a WWF magazine in their cabin. Soon there will be a dedicated WWF channel on the in-cabin TV, and the charity will be working with the cruise lines to develop eco-friendly shore excursions. In return, Royal Caribbean has pledged to meet a number of targets aimed to reduce the company’s environmental footprint and ensure the long-term health of the oceans. Greenhouse gas emissions will reduce by 35 per cent by 2020, and the cruise line will source 90 per cent of the fish consumed on its ships from sustainable fisheries. Royal Caribbean will support WWF’s global ocean conservation work through a $5 million philanthropic contribution during the partnership, and will collaborate with WWF to build global awareness about ocean conservation issues among its five million passengers a year. 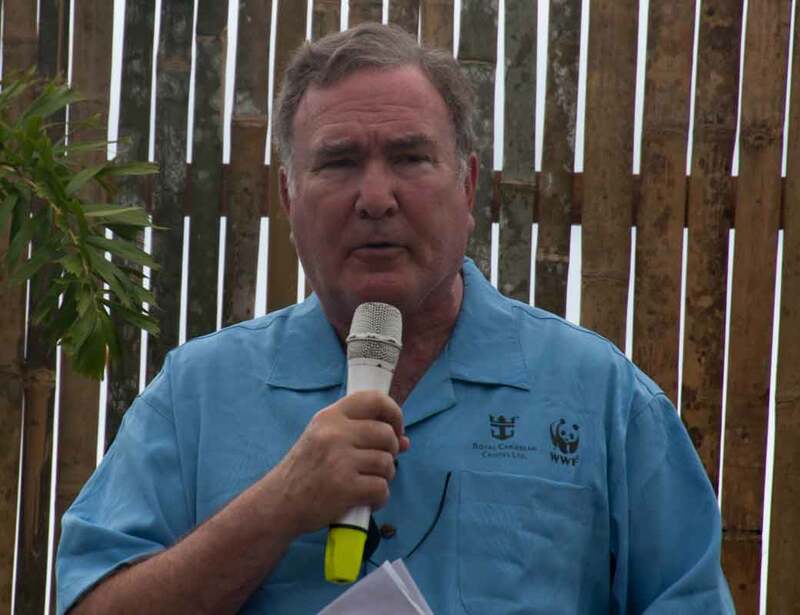 Royal Caribbean chairman and CEO Richard Fain (above) said: “Our mantra at Royal Caribbean is ‘continuous improvement,’ and this partnership with WWF represents a great opportunity to make a big step forward in meeting our special responsibility to protect the oceans.